In her 2016 novel All The Birds In The Sky, the American science fiction fantasy writer Charlie Jane Anders builds a luminescent – and already, just a year later, partly prophetic – tale of technological/ecological collapse around the intertwined lives of an inadvertent creator of next-generation artificial intelligence and a benign witch. In the book Anders resolves this potentially disastrous divergence in a couple of ways: narratively, through the eventual coming together of grown-up versions of her protagonists, one of whom is still a benign witch who now moonlights as a waitress at tech functions, while the other works on an Elon Musk-style plutocrat’s plans to head off-planet. And thematically through a fusion of advanced digital intelligence and a version of animism rooted, as in so many wisdom traditions, in a sacred Tree. The planet is not so much saved as rebooted when an omniscient personal digital device and the Tree are physically mashed together. A year after Anders’ novel is published, something happens to make me wonder if there’s a place where aspects of her imagined future already co-exist. I discover – via Twitter – that a young man called Marten Kaevats, a digital affairs advisor to the government of Estonia, has written an article on the digital publishing platform Medium introducing an official initiative to discuss and determine the legal status of artificial intelligence entities. I look up kratt on various websites that explain the country’s pre-Christian pagan religion, the Maausk or ‘native faith’. A kratt is a creature from Estonian mythology, brought to life from hay or household objects, a kind of Baltic Golem. According to a recent survey almost a quarter of Estonians believe in the Maausk, a bewildering paradox in a country which is – statistically – the least religious on the planet. A simple, verging on simplistic, explanation is that whilst organised religion is a minority interest, with the largest church (Lutheran) only attracting thirteen per cent of the population, many Estonians acknowledge and accept the ancient traditions, even when they don’t “believe in” or practise them. So much so that when a senior government adviser uses those traditions as a reference point, he can be confident it will be understood by the general public. “From a communication point of view, the ‘kratt’ narrative is useful because every Estonian knows this story. Kratts are something that society understands; AI is something that is complex and difficult to understand”, Kaevats writes. Working with local technology and media businesses, visiting, vacationing and socialising in Estonia for over a decade, I’ve only been aware of one side of this duality; the omnipresence of advanced digital technology, from the open public Wi-Fi that hits your smartphone the moment you step off your plane into the airport, to the government’s e-residency programme, the opening up of the country’s roads to testing autonomous vehicles, and recent suggestions that it could issue its own cryptocurrency. The historical roots of this advanced state of national digitisation go back to 1991, when Estonia regained its independence from the Soviet Union. One unintended consequence was the opportunity to leapfrog the ponderous IT legacy systems, programmes, tools and infrastructure in which Western nations were already heavily invested. A few years later the internet was welcomed with open arms: the governmental declared access to it a human right and an entrepreneurial and tech funding boom followed the sale of Skype – an Estonian invention – to eBay for €2.6bn, creating a first-time cohort of local multimillionaire investors. Surfing – professionally – the subsequent wave of startup activity, I’d remained unaware of the parallel omnipresence of pagan religion as I enjoyed Tallinn’s energetic embrace of startup hubs, co-working spaces, coffee shops, artisan breweries, coolly repurposed Soviet factories and an increasingly sophisticated restaurant scene – apart from being told that almost every building in the city’s picturesque old town is said to be haunted by spirits. I suspect that, like many outsiders, I discovered the Maausk by accident. Keen to help an Estonian friend who had lost his job, and along with it some of his sense of direction and purpose, I suggested walking as a vehicle for reflection and renewal in a long tradition that I mostly knew about through the work of writers like Rebecca Solnit and Frédéric Gros. Selfishly, I decided to simultaneously indulge my own geographical obsession with islands. I find something compelling in their contained-ness, the bounded self-sufficiency (socially and culturally, if not economically). Plus, as long as an island is large enough to support a full-time community, for me, less is more. I once got married on a very small one. Looking for a small Estonian island to walk around, I recalled a previous trip to – or rather across – Muhu. Muhu, off the eastern coast of Estonia, is reached by regular ferries between Virtsu on the mainland and the port of Kuivastu. It’s a drive-through island, a small stepping-stone to its bigger sister Saaremaa. In winter, when the straits are frozen, the ferry is replaced by an ice road. Muhu is a flat expanse of woods and grassy plains scattered with large boulders of glacial origin and fringed with characteristic blue-grey Baltic coastline, bleak and beautiful. Driving from Kuivastu to Saaremaa’s main town, Kuressaare, takes just over an hour via the Väinatamm causeway that connects the two islands; why stop? The only diversion likely to be worth a detour for well-heeled Estonians or international travellers is Padaste Manor, a fourteenth-century country house restored as a pricey boutique hotel and spa complete with functioning helicopter pad. My budget demands more modest accommodation, so I find online a horse farm and equestrian centre that includes a simple hostel. Helpfully, it also hosts an ‘Ancient Culture Trail’ that could function as a predetermined path for our ramblings and an alibi for our conversation to wander into deeper territory. When I call the farm to make arrangements, a friendly female voice tells me (in a tone implying conspiratorially, “if you’re lucky”) that the horse farmer himself, “the boss” may join us for breakfast to explain the route. In the event, we do a bit better than that. In the cosy dining room of our B&B the evening before our walk, we eat with the man himself, who benchmarks our strength of character against the amount of slow-cooked local pork we can consume. My companion’s pointedly unvarnished translation of the farmer’s exhortation to me is “have some guts and eat the meat”. Once our host accepts that we are attentive, non-judgmental listeners, he talks us through the cosmology of Estonia’s ‘native faith’, turning our attention to the huge oak tree that has been hewn down (although only once he had applied the appropriate blessings) and inserted into the room, creating the appearance of it holding up the ceiling, just like the World Tree or Ilmapuu held up the Earth for his ancestors. The ceiling is embedded with arrangements of tiny lights that represent key constellations of the pre-Christian cosmos. The room doubles as an introductory gallery to the religion’s ‘sacred sites’; stones, brooks, trees, bushes, springs, pools and groves which are believed to be imbued with spirits, of which there are over sixty on this island and somewhere between two and three thousand across the country. And our host, who will not reveal his age but must be well into his seventies, talks about the responsibility he carries for passing on his extensive belief in, and knowledge of, the faith to the next generation. Standing in front of the replica World Tree after dessert, he shows us how to draw the runic symbol for ‘man’ in the air in front of us: like tracing a capital ‘M’ and extending each diagonal to meet the opposite upright. We’ll need it the following day to announce our human presence at each site. Having introduced ourselves to the sacred oak we are told to hold our palms towards the bark and see if we can feel the ‘electromagnetic’ waves. We don’t know whether it’s alcohol, autosuggestion, or a bit of both but we both sense a palpable warmth in our palms. Later, reading in bed in our lodgings, I find a passage in City of Quartz, Mike Davis’ monumental social history of Los Angeles, documenting the sinister intermingling of leading-edge scientists and occultists in that city in the 1920s, most notably Jack Parsons, a rocket propulsion pioneer and a busy disciple of both Aleister Crowley and L. Ron Hubbard. This moment in the evolution of Estonia is not the first time paganism and advanced technology have been fellow-travellers. Setting out the next morning, brought back down to earth by salty porridge and black tea, homemade crêpes and apple puree, we begin by trudging through a chunk of the wild forest – pine, birch and spruce, predominantly – that covers nearly half of Estonia. This country does forests properly: huge, ancient and extraordinarily varied, with botanists noting twenty-three different types that, due to their vastness and inaccessibility, support a variety of species that includes wolves, lynx, bears and flying squirrels. We stick to the track – deeply grooved by the wheels of farm vehicles, workaday cars, the hooves of horses and the carriages they draw, peppered with the marks of various wood-dwelling animals: elk, wild boar and deer – because going off-piste in the Estonian forest is not a clever move. Every year people get hopelessly lost in them and die. Over several millennia, poor drainage from the land has also created vast tracts of equally treacherous ancient bog and “transitional” swampy or bog forests. Frequently the path is flanked by this uninviting combination of blackened trees, rotting vegetation and dank brown water. We don’t venture there. We walk on in silence to the first sacred site, The Crossing of the Seven Roads. Traditionally, crossroads on Muhu have three branches, rarely four. Reinterpreting the awkwardly translated information board – paid for, like the trail we are on, with an EU grant secured by our host, who clearly has one foot planted firmly in the material world, as much as he has the other placed in the realm of the spirits – it would seem that four roads is bad, whereas seven is special and propitious, offering protection from evil, improved health and an opportunity to meet the “lightning master”, Uku. A substantial ‘wishing rock’ to the side of the crossing is topped by a smaller stone that is used to knock on it three times whilst holding one knee against it to ‘earth’ the granting of good luck. Wishes can be for another individual, for others or for humanity as a whole, but not for oneself. The supreme god of thunder, lightning, rain, harvests and nature, Uku, “mediates wishing rites”, i.e. is in charge here. We decide to perform the ritual. We both make the human rune sign in the air and walk around the rock, clockwise. Then we turn to the West – to face the forest spirit – make the sign again and knock the stone three times with a knee pressed against it while making our wish. My friend, a well-travelled Tallinn-based urbanite, was completely unaware of the extent of the sacred sites on Muhu before this trip. Estonians appear to have an ambiguous relationship with the Maausk, a reluctance to admit its persistence and pervasiveness in contemporary Estonian culture – perhaps for fear of being mocked or humiliated. Researching the Maausk in preparation for our trip, I found myself subjected to a succession of dead ends, logistical non-sequiturs, broken lines of communication. The otherness of Estonian as a language doesn’t help, but it feels as if requests for information, putative contacts with experts, attempts to track down semi-official bodies are not so much lost in translation as in the ether. The Hiite Maja – “house of sacred groves” – Foundation, established in 2008 to “explore, present and support the natural sacred sites”, was a partner in a EU-funded cross-border cultural heritage project entitled “The Ancient Culture Sites for Common Identity on the Baltic Sea Coast” which ran 2011-2103 under the leadership of the Riga Planning Region. The activities of the Hiite Maja appear to have run out of steam since then, reduced to an annual photography competition for shots of sacred sites. Then there’s the Maavalla Koda, an organisation set up to research and preserve two strands of indigenous Estonian religion; the Maausk and the Taara, a monistic religion established in the 1930s by a group of intellectuals who rejected Christianity as a German import, yet another suppression of Estonian culture and beliefs under the yoke of successive occupying powers. Tharapita, the sacred focus of Taaraism, is the Estonian equivalent of the god Thor. Maavalla Koda has a Twitter account, of which I am the eighty-sixth member and a much more lively Facebook page that has almost three thousand followers and posts frequently about community and educational events, sacred holidays and seasonal celebrations. The epicentre of these initiatives is an academic and activist, Ahto Kaasik, who, in addition to being an Elder or Scribe of the Maavalla Koda, heads up the Centre for Sacred Natural Sites at the University of Tartu and has written a huge number of guides, surveys, books and scholarly articles on the subject. Kaasik’s own Facebook page shows a bearded, long-haired man teaching, signing books and conducting ritual promenades around big old trees. Depending on the context and his rig-out, Kaasik resembles either a cool university professor or a grown-up elf. Kaasik is no luddite when it comes to embracing digital technologies: as well as taking enthusiastically to social media, he has consistently lobbied the Estonian government for funds to comprehensively map GPS coordinates for all the country’s sacred sites. I was keen to meet him but neither of the University’s helpful, English-speaking switchboards – in Tallinn and Tartu – could find the Centre or Kaasik in their telephone or email directories. I did finally ferret out an address, but there was no response to my emails, sent in both English and Google-translated Eesti keel. The EU’s “Ancient Culture Sites for Common Identity on the Baltic Sea Coast” project stalled due to a lack of follow-on funding in 2013, but not before Muhu had been surveyed as one of the first regions of Estonia to be tackled. Students combed the island four times over a two-year period, finding and documenting a total of 65 sacred sites. As a local, our host was able to persuade his fellow islanders to explain oral traditions to the researchers, although their initial impulse had been to keep the sites to themselves. One of the ancient beliefs is that the power of such sites can be weakened if knowledge of them is shared with strangers: hence the significance of the ‘pork test’ the previous evening. Miraculously, as we make our way around the trail, Spring arrives. We shed layers and walk on. In a field beside the trees we lie on our backs, soaking up warm sun on the spongy grass surrounding the Rash Rock – so called because of its characteristic patches of an unusual red lichen – seeing if we can tune into its powers of healing ailments, illnesses or conflicts. We leave feeling uplifted, though the first few rays of spring sunshine do go a long way. Further on, we slither down the Lalli Slide Rock, polished by the backsides of numerous would-be pregnant women and anyone else seeking support for a creative endeavour; whether, in the words of the trail’s web site, they want to “build a house, start sowing spring seeds or write an interesting posting in the Facebook”. Again, contemporary technologies of social networking and ‘content creation’ sit unselfconsciously alongside a benign and pragmatic animism. The final site on the trail is the Pärase Ghost Rock, a large upright stone gashed by an angled vertical split: it’s easy to imagine the stone being rent in half by some powerful force of nature. In contrast to the previous sites, this is a place of bad energy. One of the subordinate rules of visiting sacred sites is to leave an offering. We’ve been scattered corn from the bag given to us, along with our sandwiches and a flask of tea, before we set out. Other sites require scrapings of silver, horseshoes or – like the eye-healing spring that emerges from the base of Muhu’s Panga Cliffs – coins. This one prefers a tipple: “Drunken villagers have run into trouble by the Ghost Rock if they do not have enough ale and vodka for an offering”. Ghost Rocks are attributed to the later influence of Christianity on the native faith, which sees good and evil as inextricable elements in all phenomena. Once dualism was introduced, people needed a way of locating, objectifying, the evil part – the Devil. Organised religion, imported by a series of invaders and occupiers, was never able to fully repress pagan traditions. “You first go to the church, then go to the sacred site to make sure.” is an Estonian saying. During the Soviet occupation, sacred stones and other sites were frequently hidden by locals in an attempt to save them from the flattening of the land for collective farming. Once the Russian army was ejected in 1994, though, research into Estonia’s sacred sites intensified in a way analogous to the immediate leap into the digital internet era in technology. Studies into folk mythology plunged straight into contemporary interdisciplinary mode, cross-pollinating linguistics, cultural politics, ethnology, semiotics and ecology. From this perspective, it is possible to see how, on one level, “sacred” simply denotes a type of place or object. However, it also connotes certain designated behaviours, customs, practices and so on that are activated when a person is in that location or in the space around a sacred object like a boulder or tree. In this context, ‘sacred’ means something more like ‘imbued – in that specific place – with meaning for a particular group of people’. Paying our bill at the farm hostel, the manager recognises my friend’s family name from the district over on the mainland from which she commutes daily. He’s surprised, and delighted with this revelation of geographical – and genealogical – roots of which, until now, he’d somehow not been aware. In Tallinn a couple of days later, I discover another parallel development: a reference online to a recent project by artist James Bridle who, in a work entitled Autonomous Trap 001, disables a self-driving vehicle by trapping it inside a circle of salt, a pagan technique for providing protection from evil spirits. Bridle has a radical take on the juxtaposition of paganism and technology; a near-future in which anarcho-activist-artists deploy primitive magic to take on the mega corporations developing AI. On my final day in Estonia, I’m not flying home until late that evening, so we decide to drive to the ubiquitous Nordic/Scandinavian/Baltic “hut” and attendant piece of forest that belong to my friend’s in-laws. A walk in the woods ends on a foreshore that faces the green flatness of Muhu across the channel. We spend a long day in warm sunshine clearing the undergrowth around the wrecked corrugated iron workers’ caravan that marks the epicentre of their assumed territory. “Assumed” because no-one has a clear idea of exactly where their land begins or ends. We saw away at low-lying branches and scrub, disposing of them in a roaring fire contained inside an improvised quadrangle of stones, one of which gets hot enough for me to cook the meat for lunch on it. Later, as we steadily extend the cleared circle outwards from our motley encampment into the trees, my friend gives a shout. 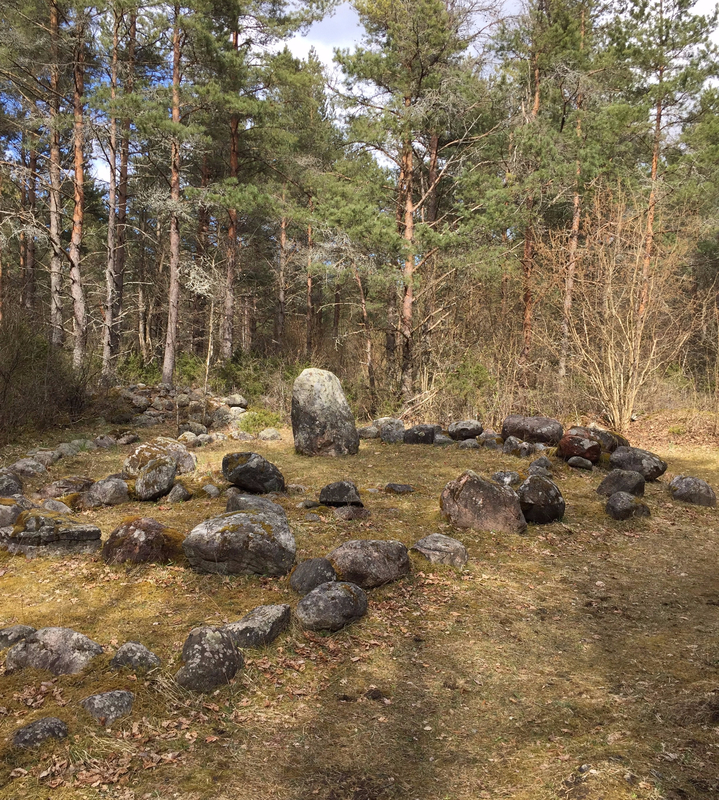 His efforts with the machete have uncovered a circle of rocks surrounding a large round boulder that closely resembles the sacred stones we encountered on Muhu. The outer circle looks too ordered not to be the deliberate work of humans. A huge grin on his face, he declares this to be his stone, his ‘portal’. He’s imbued with a feeling that this is, somehow, a kind of home, somewhere he is meant to be. A place worth building on. Later still, in a break from stoking the flames, I perch precariously on a broken folding chair, take out my phone and access the 4G mobile signal that covers the entire country. And right there, in the midst of the ancient forest with its uncertain boundaries, silent creatures, treacherous bogs and sacred boulders, I log on to an airline’s website, check in and choose my seat.